DAGYUDAN BULGUR is a family company established in 2002 in Southeastern Anatolia in which the highest quality wheat is grown in order to convert family’s century old agriculture and commerce experience into production. DAGYUDAN BULGUR added a 240 Tons daily capacity of factory in 2014 to its existing 96 tons/day capacity of factory. With its experienced staff, DAGYUDAN BULGUR, is producing according to the international standards, aimed to grow continuously, made policy to use latest technology and the best quality of raw material in production. DAGYUDAN BULGUR has a quality assurance system, starting from tracking the process of selection of seed and thrown to the soil to packaging as bulgur and presenting to the end user. DAĞYUDAN BULGUR means employment for the region, a wonderful taste for the customers, a good future for employees and pleasure for our family. The first grade durum wheats will be processed in our modern production facilities are procured from Harran Plain which has the most fertile soils of the World. 30% of wheat used in production is from the own farmlands of DAGYUDAN family and the rest 70% is procured from the farmers who are making agricultural production according to the predetermined kind and quality standards By transfering its know-how and experiences to the farmers, our company establishes its own standard for the raw material. Primarily, the taste, naturalness and quality of DAGYUDAN BULGUR arises from its sensitivity of wheat selection. The wheat subject to the quality control before production has to be fully conforming to the standards. Before production the samples are analysed in our laboratories. If the raw material can not pass the tests they never sent to the production units. To make DAGYUDAN BULGUR the first ranking and well known brand in Turkey and the world without any deviation from quality and the principles of continuous improvement. To make quality assurance systems applicable and traceable for all fields. To keep continuous improvement principles foreground in all technical and managerial workflow To be sensitive for human health and natüre To present healthy, natural and best quality products to our customers To track technological developments closely. Production is made with highest technology chromium-nickel stainless steel machines in our facilities where technology and naturality come together. To protect naturalness of products, breaking is made by stone mills instead of discs. 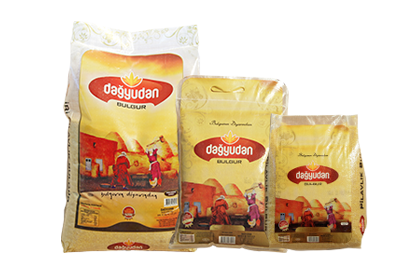 DAGYUDAN BULGUR never uses any chemical or colouring additives and checks hygiene standards during all phases of production one by one. Thus; the colour, aroma, and naturality of bulgur which is produced from the best grade durum wheat of Harran Plain is protected.